Battery going well - replacement for same model. Service and delivery excellent. Ordered this battery for my sister's scooter as her battery would not take a charge. 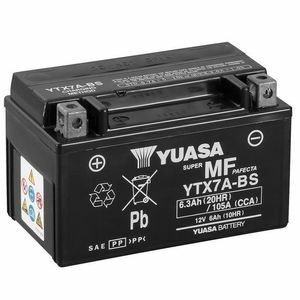 Yuasa in my opinion are one of the best battery brands out there which is why I did not hesitate to buy this one and at a very good price as well. Battery came well packaged and arrived the next day! I charged it for a few hours and fitted it to the bike. Job done! Great, identical to Yuasa battery that was originally fitted from new in 2010, must be good batteries as original one lasted for 8yrs! Great battery. Replacing one which was killed by alarm. Bike was sitting for months and wouldn't start and the battery survived the "reviving" process without a glitch. Now on trickle charger and working very well! 5 stars awarded because of excellent product & after sales service when I needed to use your enquiry service which was extremely helpful to me. Fitted To: Sym Simply Sym 49cc "09"
Excellent service - prompt delivery and goods received in perfect condition. I would definitely recommend this service.